Location: immediately at base of Ramp 23, Hatteras Island. How To Find It: Take Ramp 23 onto the beach and look dead ahead. This single beam was lying straight ahead as you drive over Ramp #23 in October, 2004. The ramp can be seen in the background right above the hood of the 4WD in the photo. 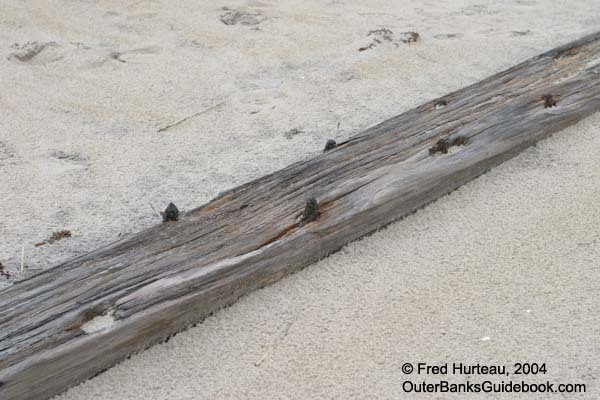 The inset shows detail of a rusted spike and patches of pitch on the beam, identifying it as part of a wreck, and not just a board washed up onto the beach from a building or pier. Individual beams like this, such as the previous beam marked ID: UNK-1_10-16-04 on page 2, are easily moved or buried in storms. It is very likely these smaller pieces of wreckage may not be found in a few weeks. Certainly it is likely a winter storm could move or bury them before spring. Location: at high tide line approx. 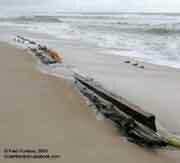 1.3 miles south of Ramp 23, Hatteras Island, very close to wreckage site UNK-1_10-16-04 (on previous page 2). How To Find It: Take Ramp #23 onto the beach and turn south. Go approx. 1.3 miles and look for wreckage at high tide line. What appears to be a single beam could well be much more than is visible in these photos. Only the pegs and metal spikes gave this site away. Someone had taken the precaution of laying a plank across this piece of wreck to help keep fishermen from driving over it with their 4WD's. The plank was moved for these photos, and then replaced for safety. 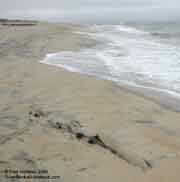 This site is at the edge of the surf, and may cover with sand or become more exposed at the whim of the tides. The next time this is visited, it might be discovered it was only the tip of the iceberg of some old hulk buried in the sand, or it may be gone from sight completely. 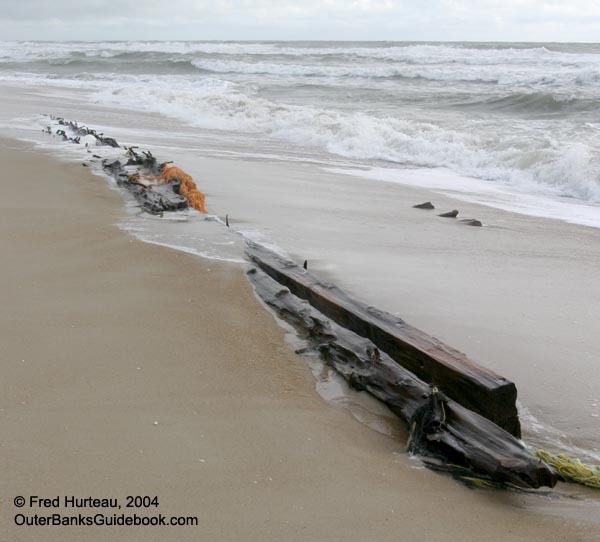 That's part of the fun and mystery, and frustration as well, of searching for these visible wrecks along the Outer Banks. These photos were taken about an hour before high tide, so it should be visible about any time except peak high tide. Location: at high tide line approx. 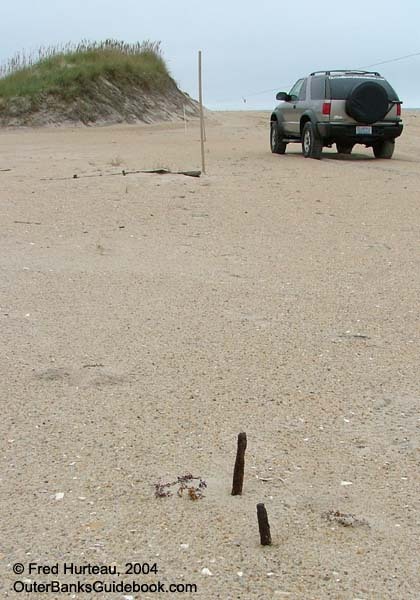 2.2 miles south of Ramp #23 (or 2 miles north of Ramp #27), Hatteras Island. How To Find It: Take Ramp #23 onto the beach and turn south. Go approx. 2.2 miles and look for wreckage at high tide line. Taken one day apart, the bottom photo shows tips of 3 ribs and more beam exposed, especially to the right end, as compared with the top photo. 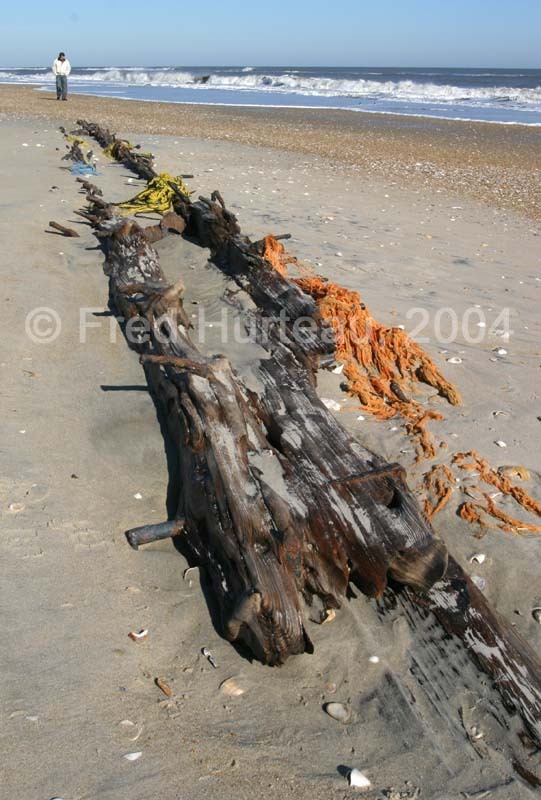 Wreck site "UNK-5_10-20-04" is at least 40 feet long, found in the edge of the surf at high tide. A fisherman nearby said that more of the beam had been visible the previous day, and that overnight the tide might uncover more of it. The next day this site was revisited, and sure enough, a little more of it was visible. 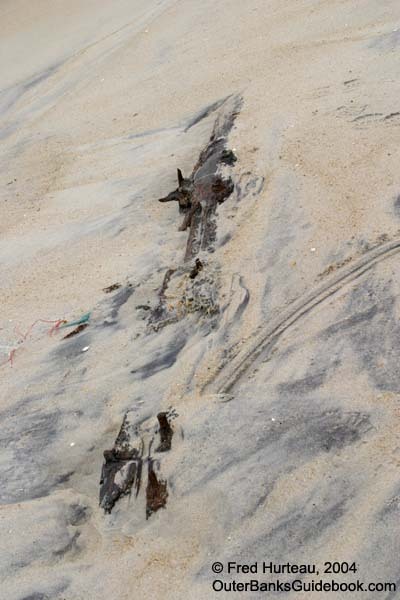 This time it was obvious the long beam had horizontal ribs associated with it, as there were three rib tips now visible. 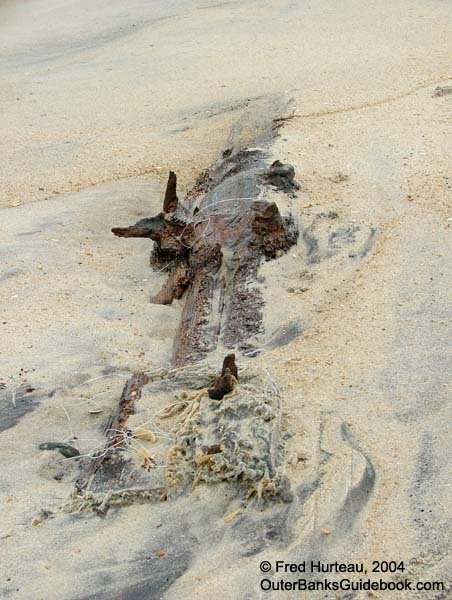 There is surely more of this wreck under the sand, and only time will tell if it will be uncovered more, or completely buried again as the waves wash over it at the edge of the surf. 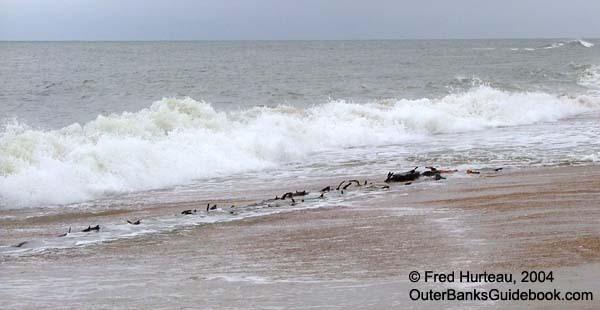 The orange and yellow objects in these photos are ropes and lines washed up by the surf, which are entangled with the metal spikes on the wreckage. 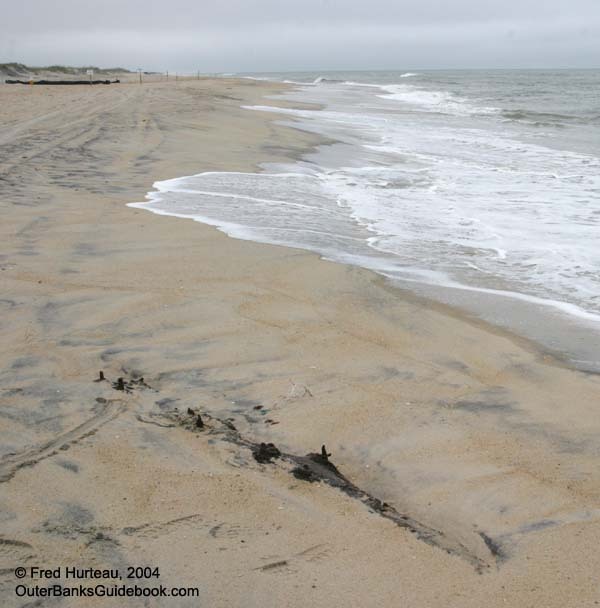 Update - While the beam itself was more visible at the end of December, 2004, ten weeks after this was first photographed for CarolinaOuterBanks.com, the ribs that had been showing at first were no longer above the sand. These two new photos of this site give some sense of the length of these beams when compared with the person in the photos. The left image shows the full length of the beams, while the right image shows more detail of only the north half. Location: at dune line approx. 1.5 miles north of Ramp #27, Hatteras Island. How To Find It: Take Ramp #27 onto the beach and turn north. Go approx. 1.5 miles and look for wreckage at dune line. A single plank from a wreck sits atop the sand near the dune line as shown in these photos. 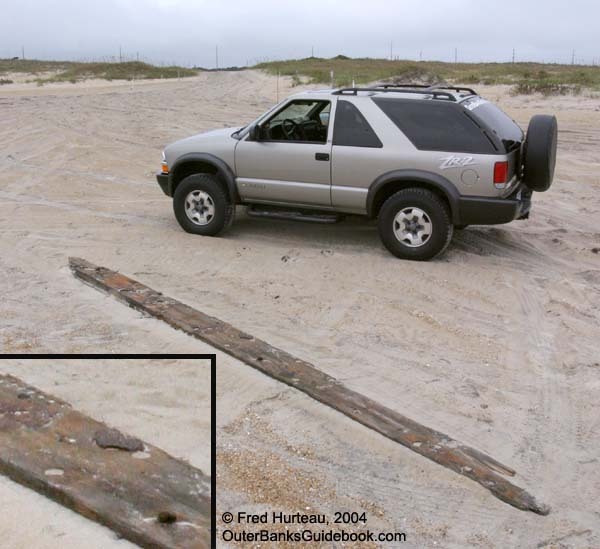 The plank was about 15 ft. long, with rusted spikes all along it's length. There were no other obvious pieces associated with it. 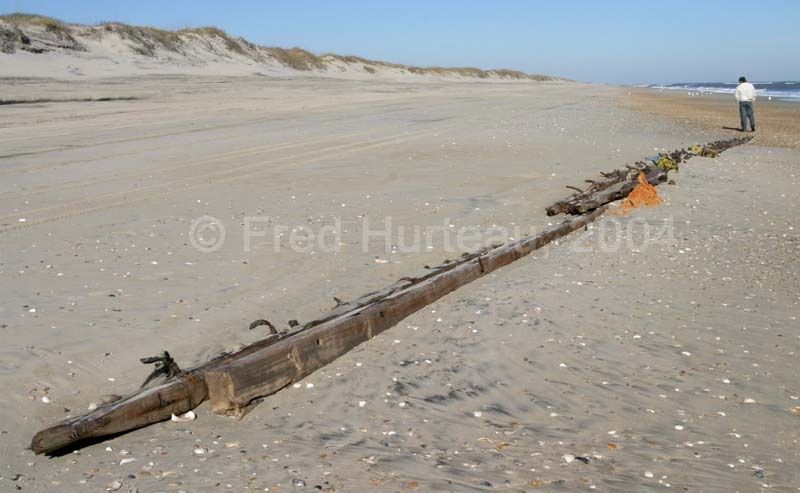 This piece probably floated to the high tide line and the park ranger beach patrol moved it out of harms way next to the dune line where no 4WD's would be likely to run over it. 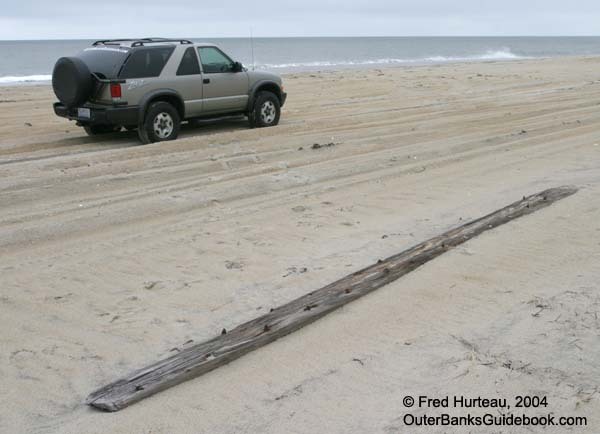 This plank will probably be covered by blown sand before a storm comes along severe enough to float it off to some other location. 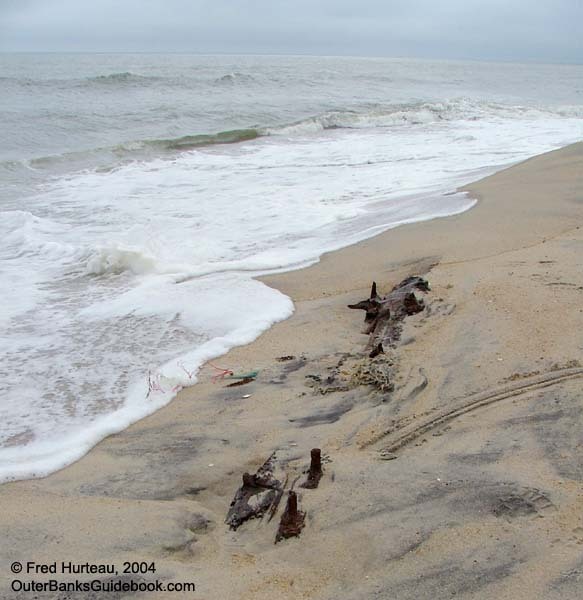 This is but one of eight small and large wreckage sites found along a single 4.2 mile stretch of beach between Ramps 23 and 27 in October of 2004. 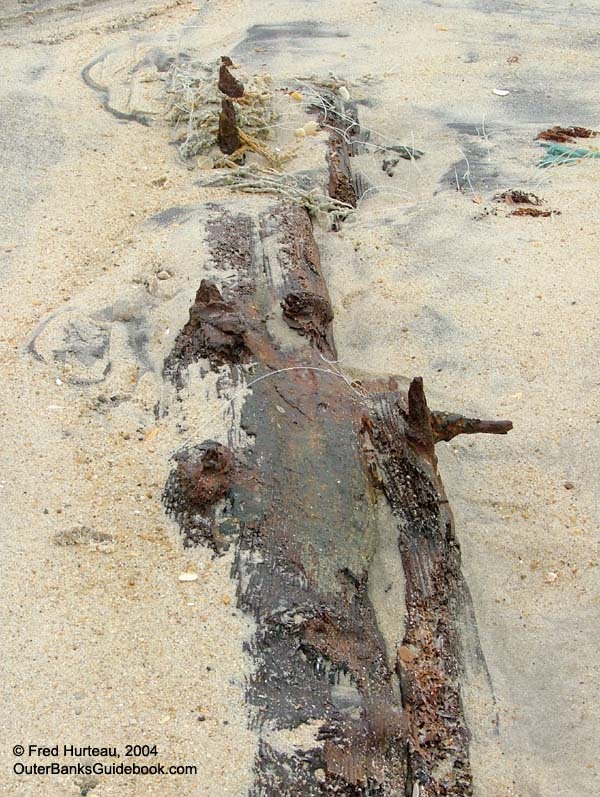 Update: This is possibly a piece from the "J. Henry Wreck" site located only 500 ft. away in the surf, which is believed to be the 1915 shipwreck of the Loring C. Ballard. Location: buried at base of dune approx. 1.3 miles north of Ramp #27, Hatteras Island. How To Find It: Take Ramp #27 onto the beach and turn north. Go approx. 1.3 miles and look for spikes sticking a couple of inches out of sand at dune base. "What wreckage? I don't see any wreck." Is that what you're thinking? Well, there's much more here than meets the eye. 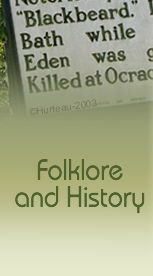 Take a CLOSE look at the photo at left. Finding pieces of shipwrecks isn't always as easy as stumbling across a huge section of ship's hull lying on the beach in plain sight. This certainly wasn't easy to spot driving up the beach. 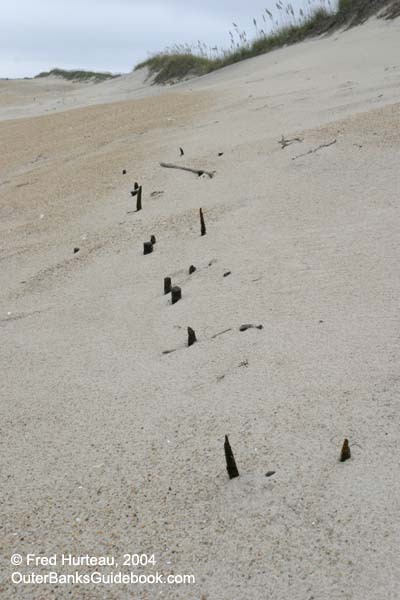 But after looking at quite a few shipwreck sites, the pattern of dark dots in the sand, standing in a nice neat row, becomes a recognizable clue. Take a close look at the photo at right and you can see just how easily this site could have been missed, even standing next to it. There is no telling how much more hides beneath the sand here. A minute or so of scratching around in the sand with one hand revealed wood, as seen in the photo at left. 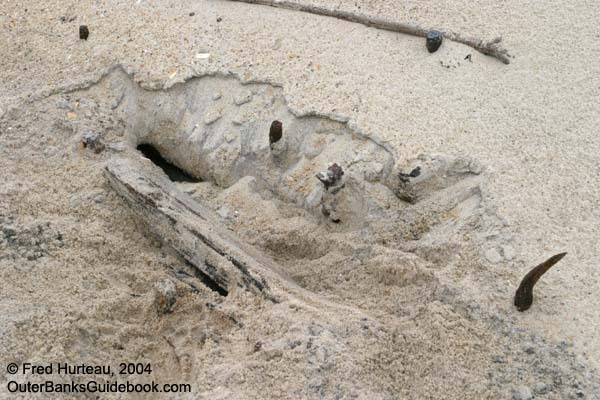 It also broke through a thin layer of sand between two pieces of wood, and a hole opened up. Sand began trickling down into this hole, like sand in an hour glass, verifying there was indeed much more hidden away here. Perhaps on the next visit to this site more of this mystery will be revealed. Or, it might be completely hidden by the sand. At least now with GPS coordinates, the exact location can be found, even if it is not visible to the eye. 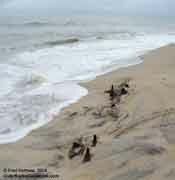 Location: at dune line 3/10 miles north of Ramp #27, Hatteras Island. How To Find It: Take Ramp #27 onto the beach and turn north. Go approx. 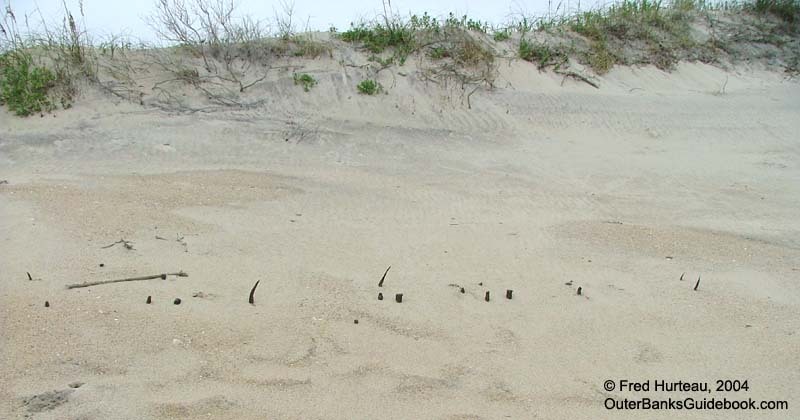 3/10 mile and look just behind the roped off area at the dune line for 2 spikes protruding from sand and a partially buried beam about 20 ft. north of the spikes. 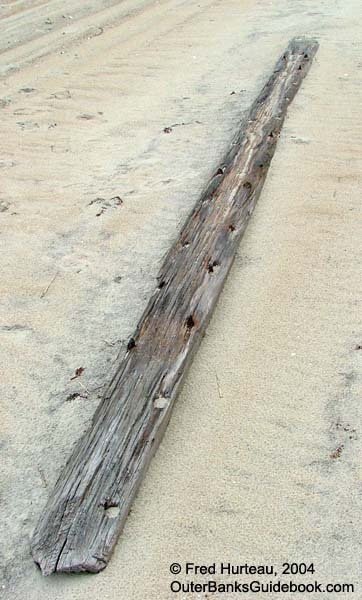 This beam was located about 20 ft. from two spikes which gave away the location of more wreckage. A little digging verified these spikes were indeed attached to more wooden wreckage. 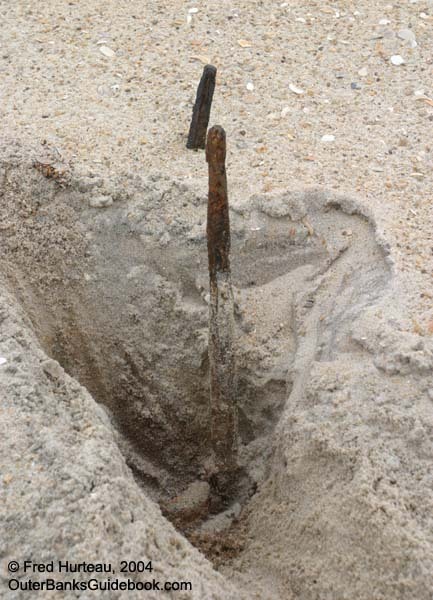 Two pieces of wreckage were found in close proximity, one of which was completely buried except for two metal spikes poking about 3 inches from the sand. 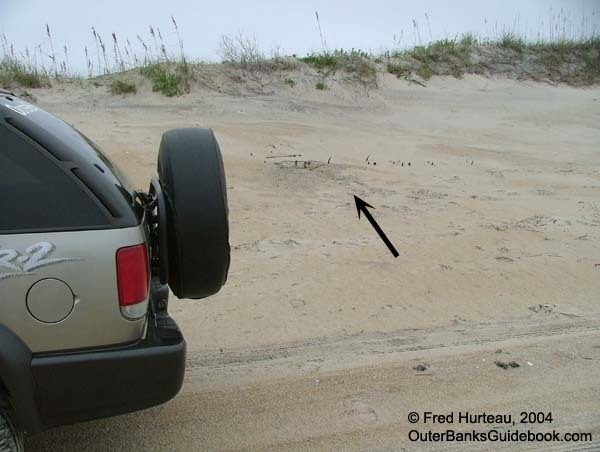 Both were just inside the dune area roped off by the Park Service to keep vehicles out of the dune area. 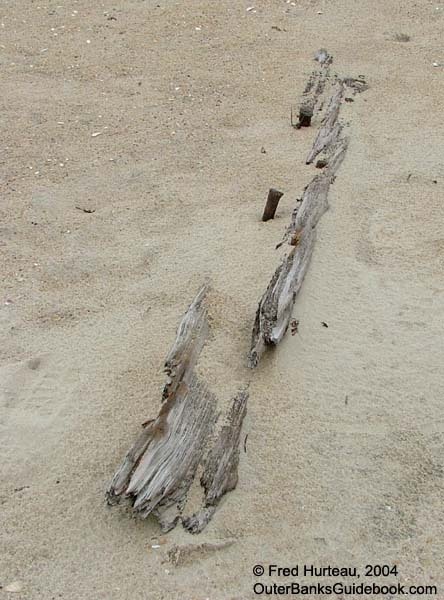 The beam was mostly covered by sand, and seemed to be a single piece. The two spikes could be part of something larger. 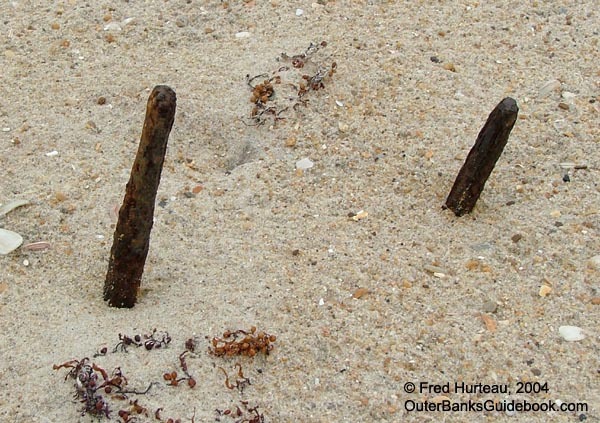 A minute or so of scooping sand with one hand revealed the spikes were at least a foot long, and were embedded in wood beneath the sand. How much more was beneath the sand could not be determined. This site, like site "UNK-7" above, could easily be missed, and may become completely covered, or be uncovered to greater extent over the winter. Only time will tell. At least, with GPS coordinates available, this location can be revisited with certainty to see what happens. Who knows what story of disaster goes along with these pieces of ship, what woeful tales might be known if we had any clue what vessel they came from. The sea gives up its secrets reluctantly, and the Graveyard of The Atlantic certainly has many secrets to keep.